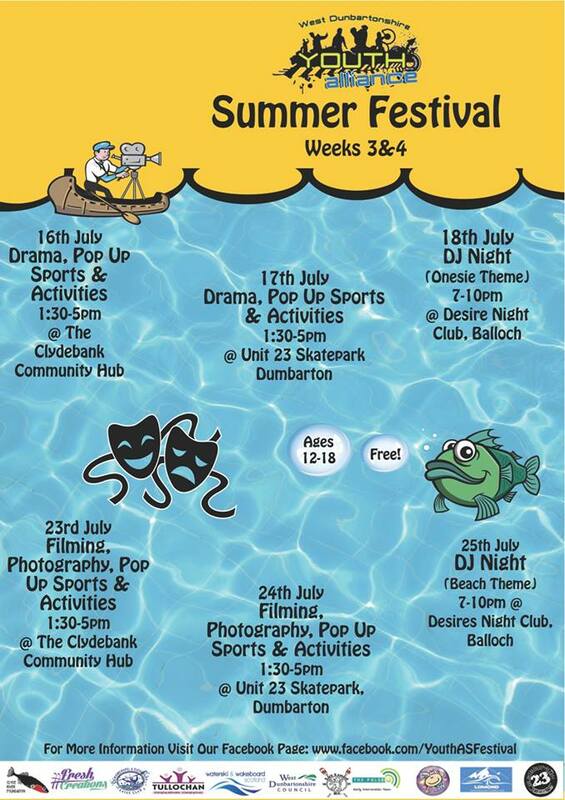 This Festival is FREE and for all young people aged 12-18 living in West Dunbartonshire. Sign up on the day – under 16s must arrive with parent / guardian to fill out their forms. Over 16s can do this themselves! 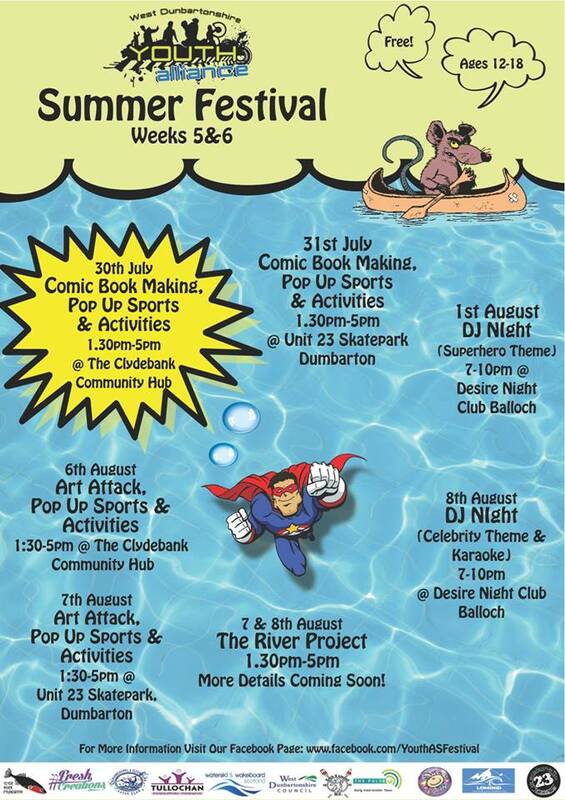 Each day there will be a break from 3-4pm so bring a packed lunch or some money for the tuck shop. PLEASE NOTE: Young people will not be allowed to leave the premises. Come along and help design and create a mural to be displayed at the Y sort it. Using urban art techniques we hope to create a vibrant and attention grabbing piece of art. 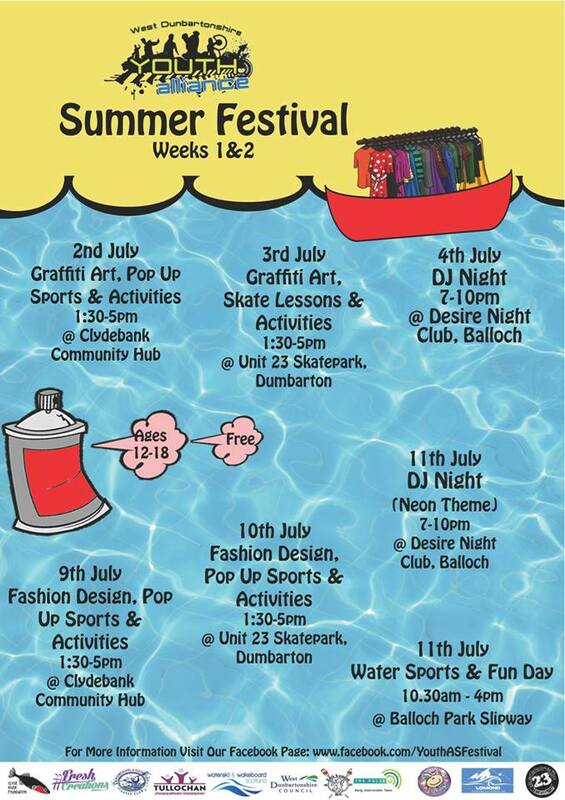 Urban art and skate parks go hand in hand so why not come along to Unit 23 to help us create a mural that will be appreciated by the patrons of Unit 23 for years to come. Drama Workshop Details: Are you up for a challenge this summer? Think you have the skills to learn a script and perform it by the end of the day? Well then come to Play In A Day led by two experienced Theatre Directors and learn scenes from a fantastic play for young people, by an acclaimed Scottish writer. Whether you are new to drama or a total drama queen, this is the Theatre experience for you! Photography Details: Learn some tips, tricks & techniques to take exciting photographs to surprise yourself & your friends. Discover how to look at the ordinary & make it extraordinary. Plenty of scope to use your imagination & be creative. Comic Book Details: Starting with the basics of comic strip drawing. Cubes, cylinders, circles, face, figure and perspective. We will develop pencil technique into pen and finally adding colour. Make yourself into a comic book character! Create your own characters or design your comic book front page! POW! Art Attack Details: Drawing with light in the air, capturing movement, time, colour and form using our digital cameras. We will then go on to make our own light sources by adapting our torches using colour filters and contraptions. These new hand made tools will then be tested and experimented with in fun and exciting new ways.